These and statements like them may be uttered by you about your boss, husband, wife, kids, friends, etc. But what if the very thing you hope and crave from another is exactly what is missing from you? What if what you are asking for is what you should be giving more of? 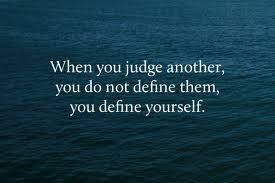 Often the very thing we judge about someone is the thing that is lacking in ourselves. If you hold a light up to yourself, you may have one of the most profound awakenings of your life. I tried this recently. I thought about the last few months and who I made comments about, who I judged, and who I expected more from. What an unpleasant jolt to the ego. You mean the person I judged about not following thru is me? Oh yes! The people I thought didn’t show me enough attention is me not showing enough attention? You bet. So this week, Practice giving what you would like to receive. If you wish for kindness, be more kind. Before you ask for love, embrace others with love first. It’s actually quite simple. Showing more respect, kindness, and love can never be overdone.